Ronald Neumann, former ambassador to Afghanistan, Bahrain, and Algeria will discuss diplomacy in the current geopolitical climate at Texas A&M. President George W. Bush and U.S. 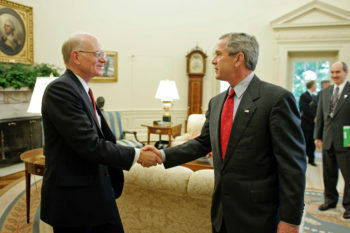 Ambassador to Afghanistan Ronald Neumann shake hands in the Oval Office of the White House July 20, 2005 in Washington, DC. On Tuesday, March 19, Ambassador Ronald Neumann will deliver a lecture on American diplomacy in the Presidential Orientation Theater at the George H. W. Bush Presidential Library and Museum on the campus of Texas A&M University. A reception will start at 5:30 p.m., followed by Neumann’s remarks at 6 p.m. This free event is open to the public and is hosted by the Scowcroft Institute of International Affairs in the Bush School of Government & Public Service at Texas A&M University. To register for the event, please visit: tx.ag/Neumann. Neumann will discuss diplomacy’s role in politics in different regions, specifically American diplomacy in the current geopolitical climate. This will include discussing the differences between diplomacy and policy and why professionalism is needed. Neumann will also speculate on how America’s current posture measures up to diplomacy’s standards, and he will discuss the practices of other major powers. Neumann dedicated his career to public service, including serving as an Army infantry officer in Vietnam; Ambassador to Algeria, Bahrain, and Afghanistan; career member of the Senior Foreign Service; and Deputy Assistant Secretary of State. He is the author of memoirs, monographs, articles, and editorials, with his writings focusing on Afghanistan, stabilization, and Bahrain. Neumann received many awards throughout his service, including the Army Outstanding Civilian Service Medal and the American Foreign Service Association’s award for Lifetime Contributions to American Diplomacy. He currently serves as President of the American Academy of Diplomacy.